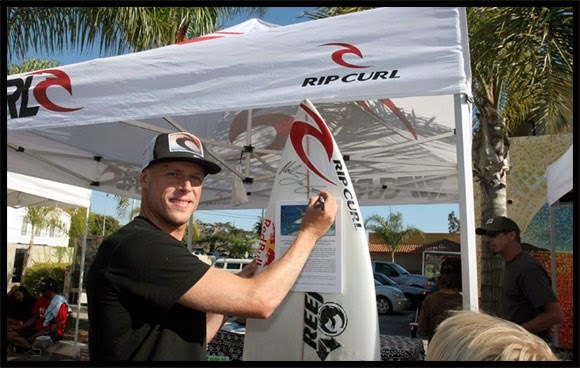 Surfing Heritage & Culture Center: Mick Fanning, 2013 World Champ! Mick Fanning, 2013 World Champ. This tribute is a little over due, but as they say, “better late than something or other.” Mick only won 1 event during the 2013 season (Quik Pro France) but managed to place high enough throughout the year (a 2nd in Fiji, 4-3rds, 3-5ths, etc.) to secure his 3rd World Championship, proving lightning sometimes strikes thrice. This board was secured for us by Sharon Marshall, and was ridden by Mick in 2009 at the Trestles contest, which he won. He then went on to win his second world title (his first was in 2007). We finally tracked Mick down a year later at that same contest and got him to sign the board. Thank you Mick and Sharon!